All my one-year-old cared about was smashing his hands into that caterpillar cake’s frosting-covered head, and rightfully so! 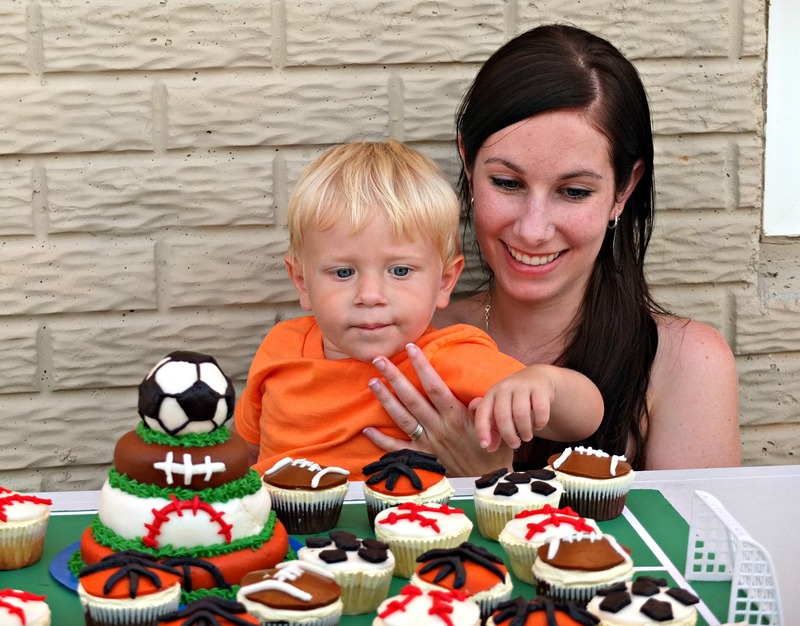 But for my son’s second birthday, I wanted the theme to better reflect his interests and personality. 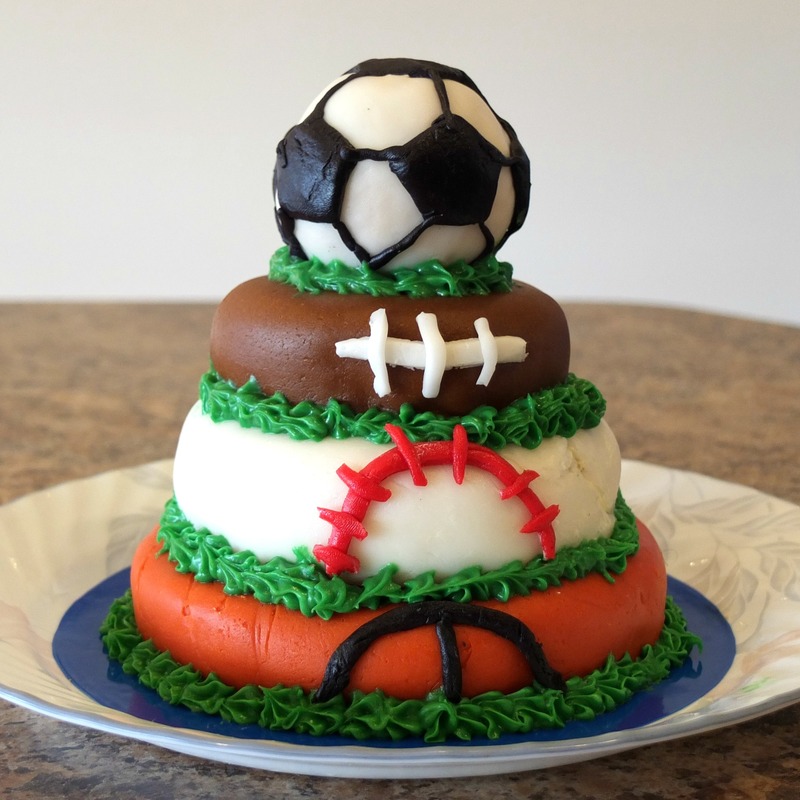 I wanted the celebration to revolve around something he loves. 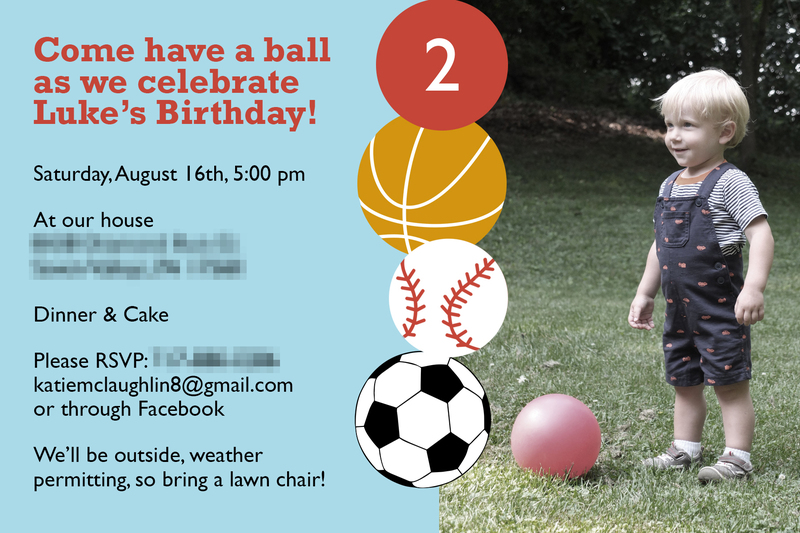 This gave me no other choice than to throw a ball-themed bash! Let’s Have a Ball Birthday Party Tweet this! My husband put together this adorable invitation. 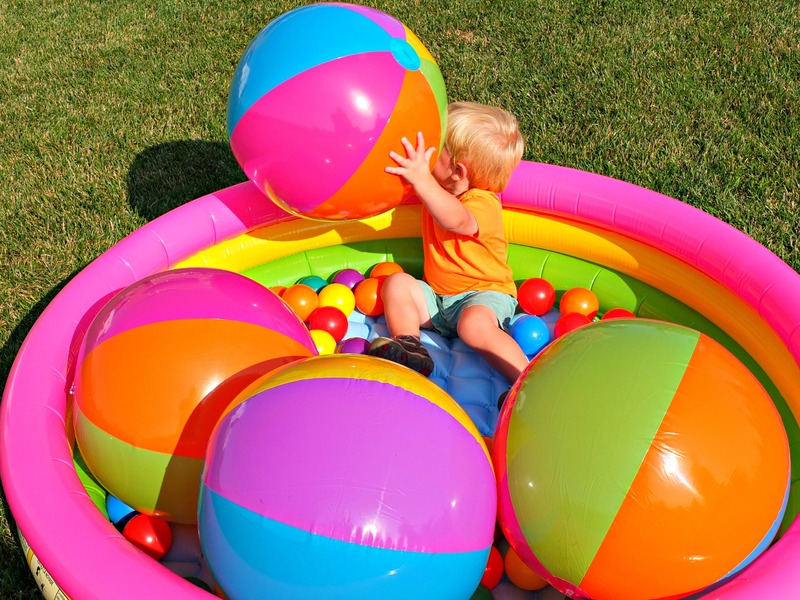 Because my kiddo is obsessed with balls, we had trouble picking a single photo to include. (This epic shot was also in the running!) But ultimately I loved how this picture looked with the design. This year I didn’t bother with a lot of traditional decorations, especially since the party was outside. 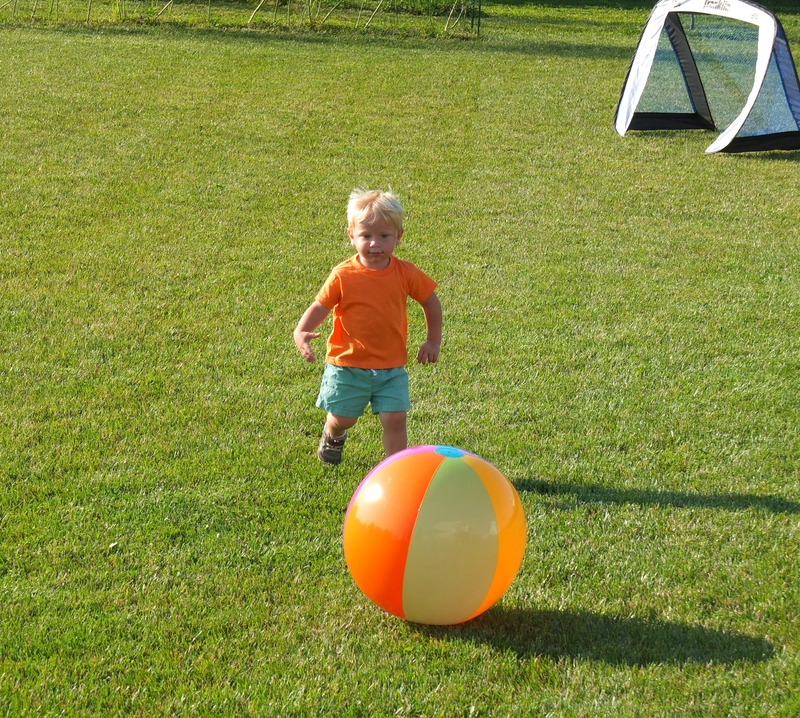 Instead—to the absolute delight of our toddler guests—I focused on littering my yard with every type of ball imaginable. 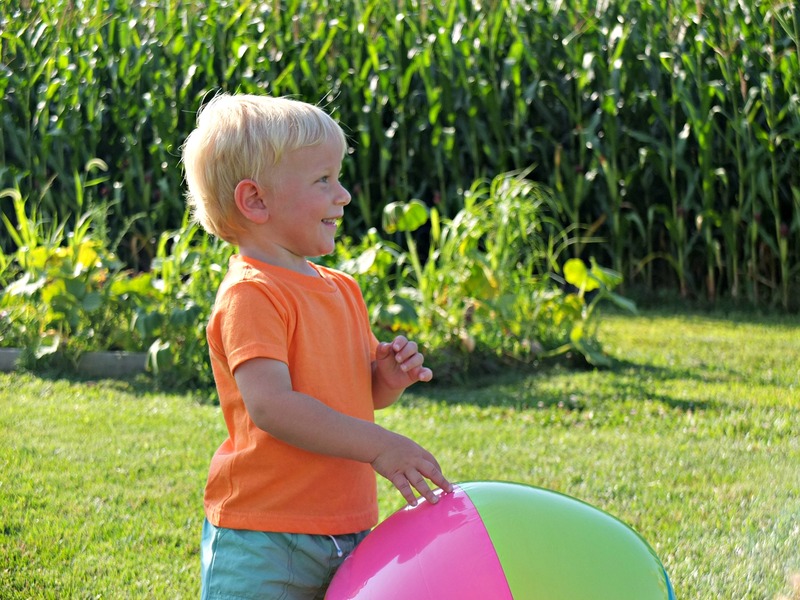 I filled our Radio Flyer wagon with all the balls I could find in my house, and also set up a baby pool overflowing with beach balls and plastic ball pit balls. The latter was a huge hit with the kids and adults alike! 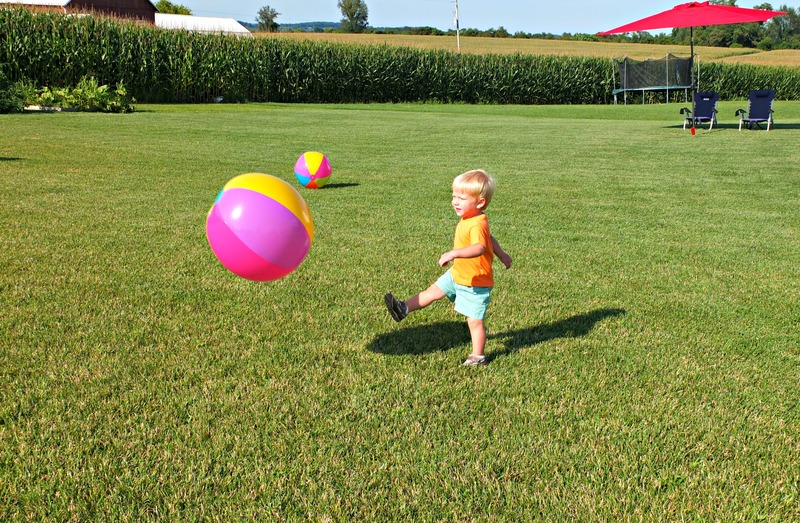 About a half hour into the party, balls were scattered everywhere—a dream come true for my two-year-old! We were so lucky to have my sister-in-law agree to make the cake again this year (yes, the same baker extraordinaire who created last year’s Very Hungry Caterpillar cake and cupcake scene). 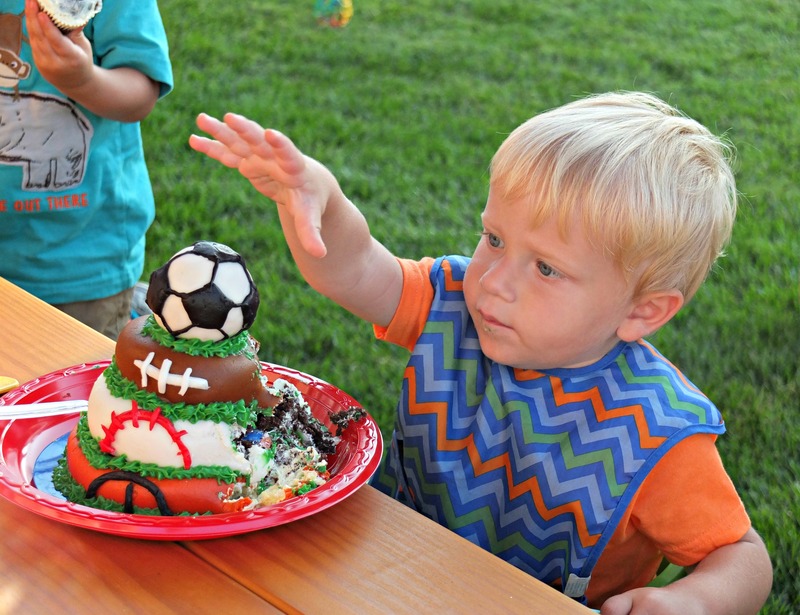 This year she envisioned a ball-themed layer cake for Luke to dig into—topped with a Rice Krispies Treat soccer ball. Considering the only cake I make comes from a box and looks like it was iced by my toddler, I was amazed when she walked in with this! The cake was specifically for Luke to devour (which is exactly what he did!). 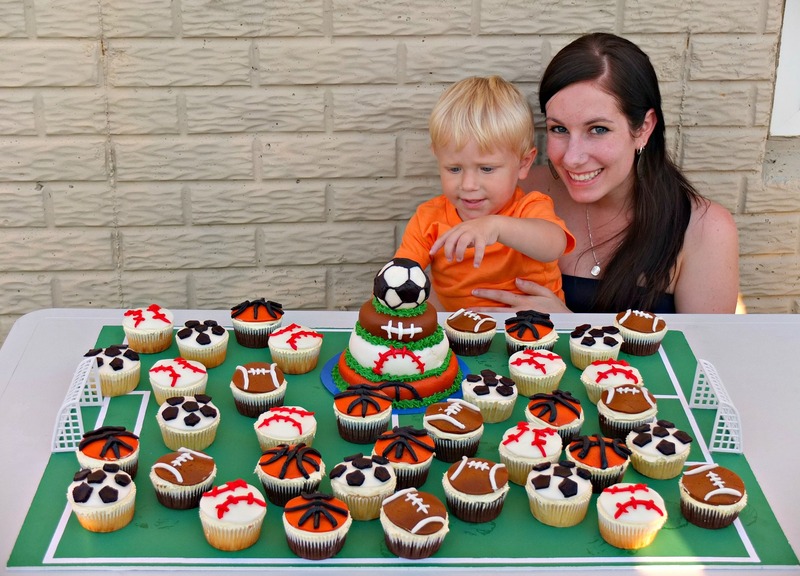 Everyone else got to choose from this delicious display of baseball, football, basketball, and soccer-themed cupcakes. The baker and the birthday boy! I’m not sure what he wished for when he blew out the candles, but it was probably for his aunt to make his birthday cake every year! 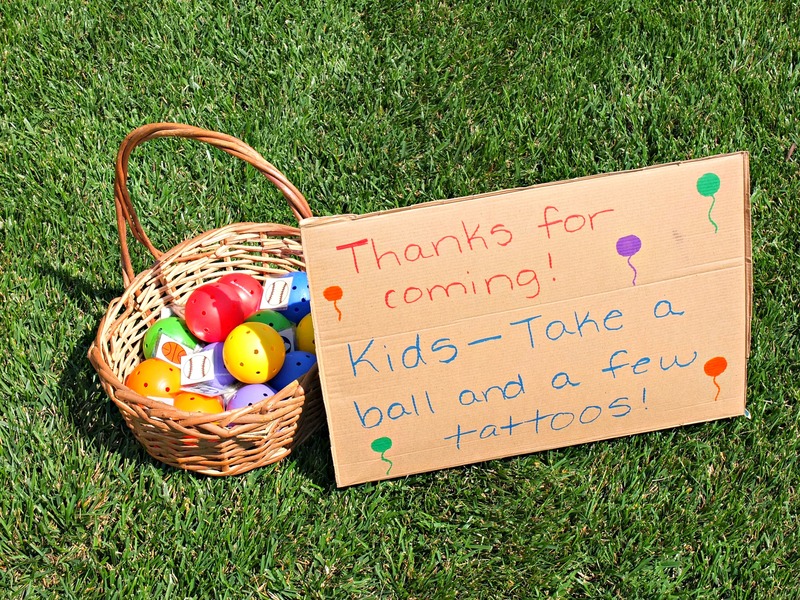 I skipped the traditional goodie bags and instead sat out a basket with brightly colored wiffle balls and sports-themed temporary tattoos. Way easier and just as fun! I’m still wrapping my head around the fact that my little boy is already two years old. I’m so thankful we could celebrate his special day surrounded by family, friends, and his all-time favorite toy! 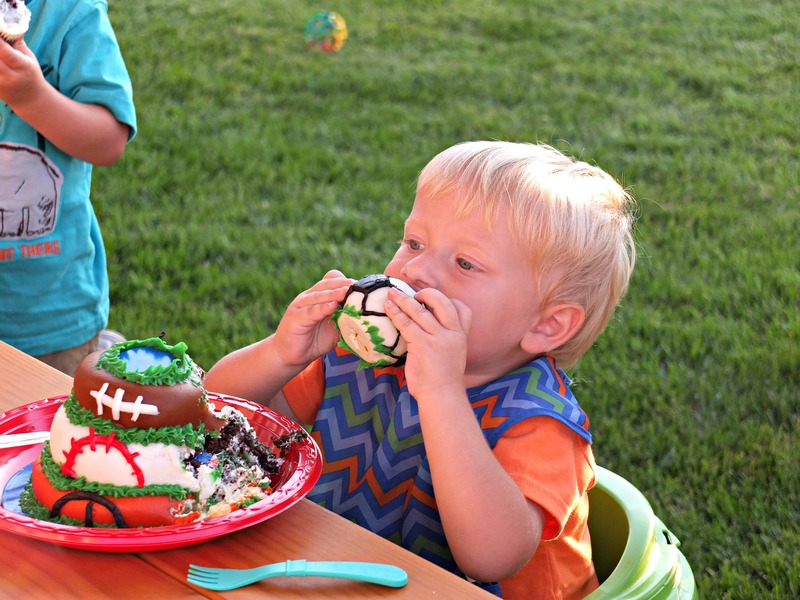 What was the most memorable part of your child’s last birthday party? Love this idea! I’m sure I would have been wishing for my aunt to make the cake every year too. 🙂 It was gorgeous. Looks like he had a wonderful birthday. 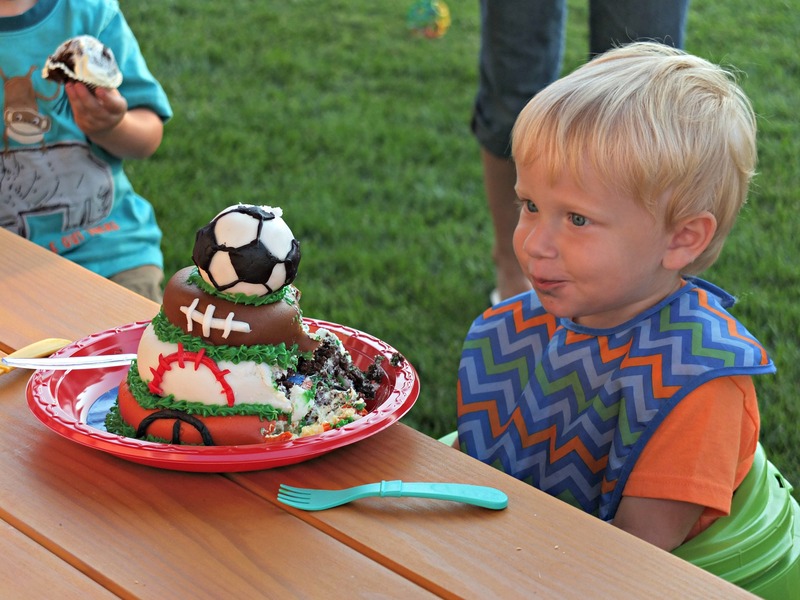 It really was an incredible cake—he’s a lucky boy! This would be perfect here… or a splash party! Reality is parties are simple in our home. When our kids are older they will have more input. 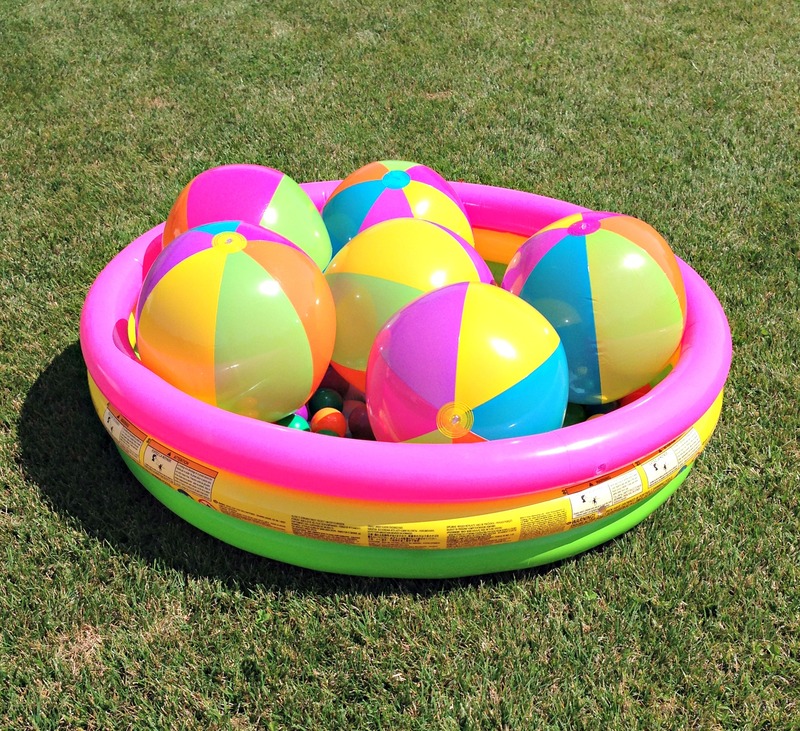 We honor them with a personal day tailored to their personality and the weather, not a huge bash as family is far away (and the kid population in our town is super low…. I don’t know another toddler personally). A personalized day sounds like a perfect way to celebrate! What a spectacular looking birthday party for a two year old! 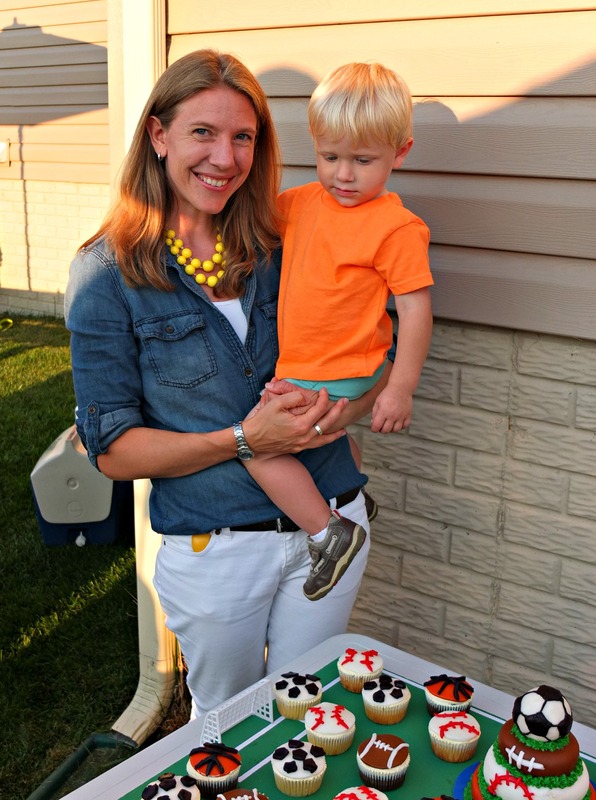 I have to admit that we didn’t not through a full-on birthday party for our son until he was three, as we figured he wouldn’t really know what was going on, but he probably had some sense of the event when he was two. For this 3rd, we hired a “pirate” to come to his party. He still talks about Patty the Pirate and how she came to his birthday party! 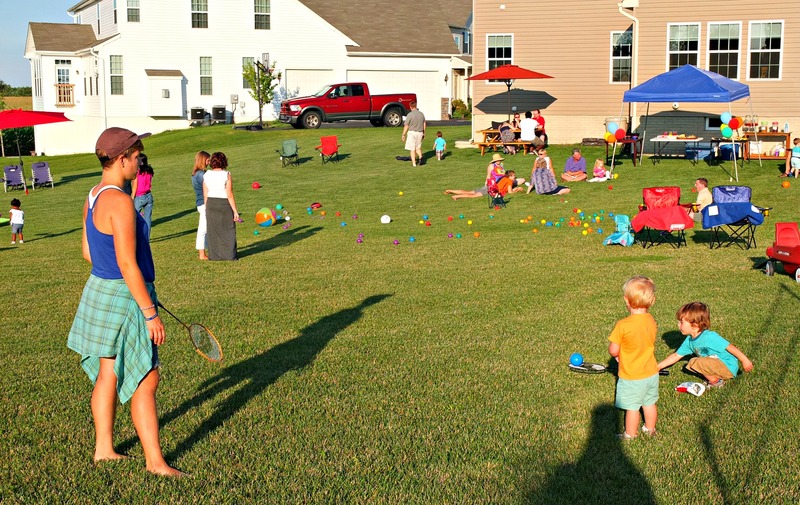 I used to love planning my kids’ parties – My son’s second birthday was a puppy party, but I can’t remember all the details. His bar mitzvah party was a Baltimore Raven’s theme, which was so easy and fun. You did a fabulous job, Katie, and your sister-in-law is so talented. The look on Luke’s face as he’s gazing at his cake is priceless. I know, that’s one of my favorite photos! So much fun! I love that cake so much. We are in full on birthday planning mode here too 🙂 Fall babies rule! It also looks like you got a beautiful day for his party. So glad. I think party planning can be incredibly fun. We totally lucked out with the weather. Considering the party was in mid-August, it could have been sweltering, but it turned out to be a perfectly pleasant evening. Love this! My oldest is a HUGE sports fan. He would absolutely love that cake! I’m going to pin it so I’ll remember it in the spring when his birthday rolls around. Awesome, I hope he just adores it! We did a Lorax theme at our local orchard for Nolan’s last birthday. Two of the most memorable parts were unplanned-guestsv playing on the haybales & my mother-n-law decided to spring for a hayride. We are planning on a baseball theme this year. Katie, this is just FABULOUS! I love the cake and all the details to make it special. What a birthday for a toddler – really wonderful. Beautiful pictures too! I loved seeing you in some photos! Love all the photos! Looks like everyone had a ball ;). We did the very hungry caterpillar for my son’s first bday too. Of course this year there was tons of Eric Carle stuff in the dollar spot at target! 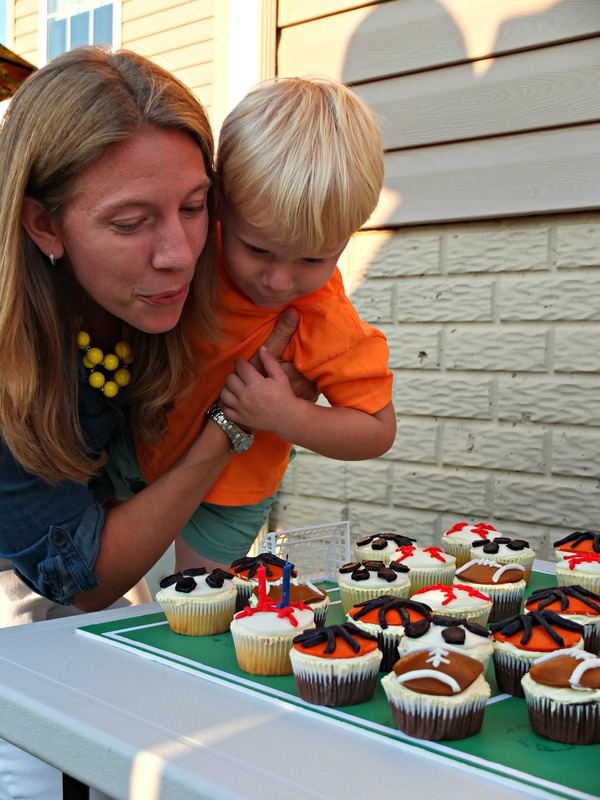 We did trains this year for my son’s bday for the same reason you chose balls/sports… I wanted my son to be excited about it! 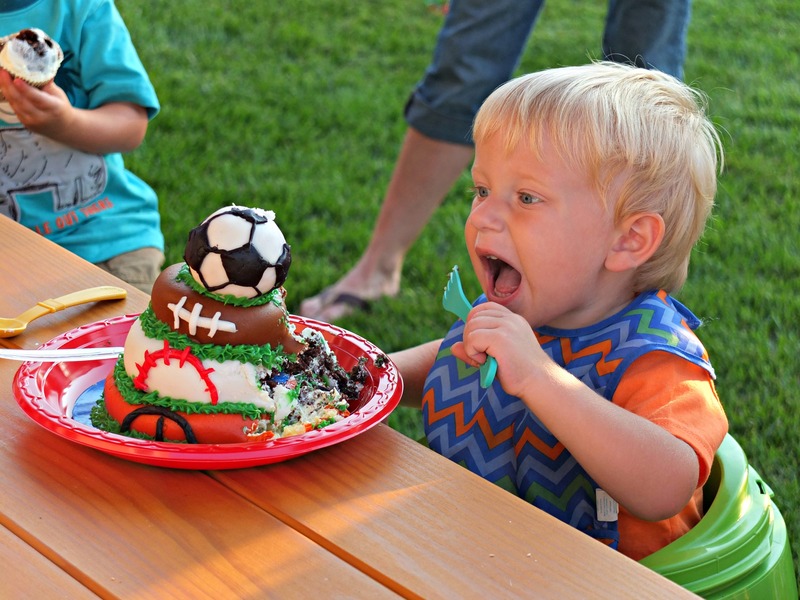 Thanks for sharing your sweet pics… Looks like the cake was delicious! Trains would have been our second choice! They’re a big hit in our household too. I love how the party turned out! 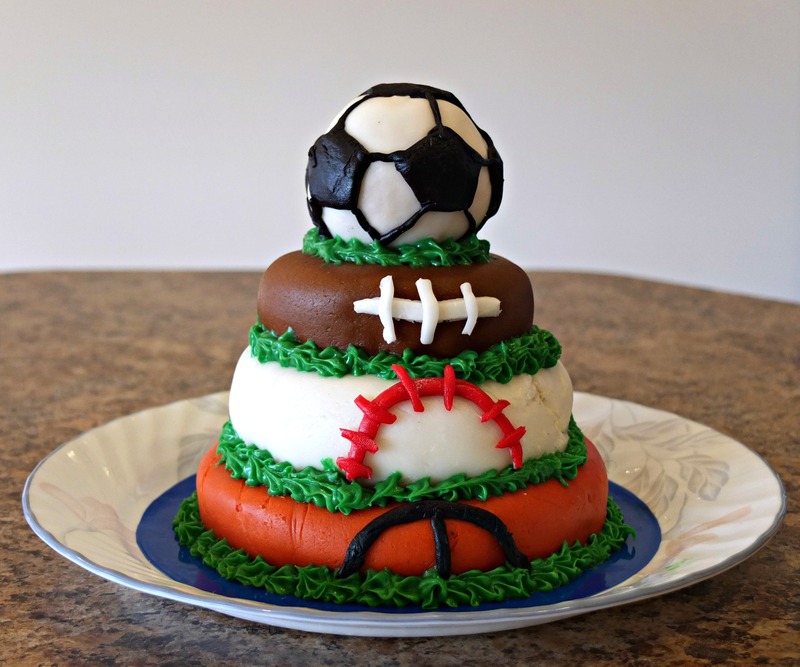 Gave me such great ideas for my sons 2nd birthday coming up!